White fish like cod make the perfect base for these baked fish nuggets. You can buy cod fillets fresh or frozen and they are comparable in cost to chicken breast. Cod is a great protein substitute for pescatarians (people who do not eat land animals) and is low in calories and fat while also being high Vitamin B12, which is needed for essential body functions. We baked these fish nuggets ourselves using healthy methods vs. buying prepackaged fried fish sticks and the final result is a delicious, flaky and mild baked fish nugget that will be a hit with children and adults! If you have time, make your own tartar sauce as well. All you need in Greek yogurt, lemon juice, capers and salt and pepper (we through in some hot sauce to make it a bit spicier). This meal is a quick and easy weeknight dinner that you can feel good about eating! Slice the cod into nugget shaped pieces. Mix the three eggs together, then pour them into a large Ziploc bag. Add the cod, seal and shake well to coat it in the egg. Next, pour the panko and salt and pepper into the second Ziplock bag. Remove about 5 nuggets at a time from the egg mixture and place in the panko bag. Seal then shake to coat thoroughly with the breadcrumbs. Transfer to a nonstick baking sheet after finishing and repeat until all the nuggets are done. Bake for 25 minutes until the panko is golden brown. 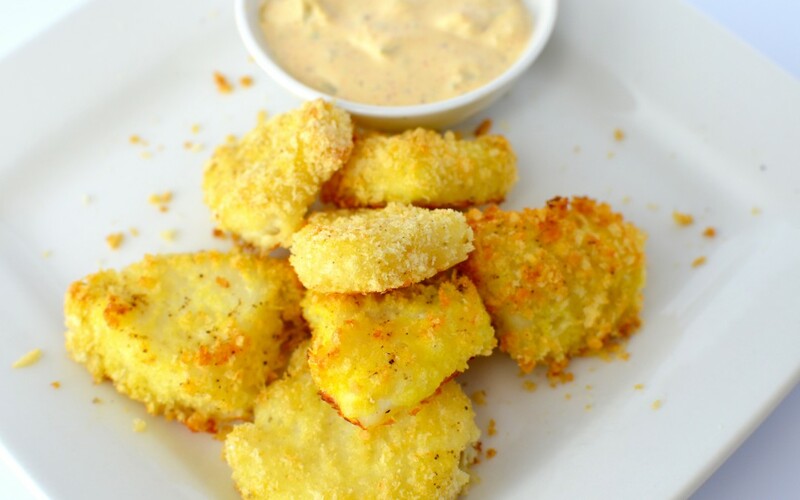 Serve with tartar sauce and your favorite veggies!